A Unique Invitation: Work with John Rosemond & His Team! Welcome to a very rare opportunity to become a John Rosemond Leadership Parenting Coach with the goal of helping you develop your own Leadership Parenting Coaching practice through the training and support of John Rosemond’s Leadership Parenting Institute. As one of John Rosemond’s Leadership Parenting Coaches, you will have a direct affiliation with one of America’s most respected parenting experts who will be there for you as you build your own Leadership Parenting coaching practice. To get started, fill out the form below. Once submitted, you’ll receive a 1-page application. For more information about our Coaches Program, call 704.860.4711 or Click here to Send an email with details. Yes! 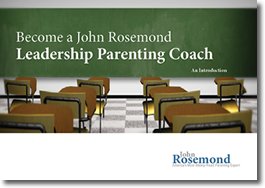 I would like to learn more about becoming a John Rosemond Leadership Parenting Coach. Please send me an application.